Come and join us for an enjoyable night of poetry at 7 p.m. Oct. 9 in the Hemisphere Room on the fifth floor of Hale Library. 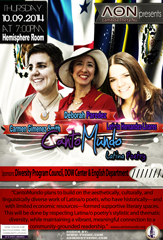 The ladies of Lambda Theta Nu sorority invite you to the Canto Mundo Latina poetry reading. Snacks and refreshments will be provided. Our guest speakers will be three renowned scholars and poets: Deborah Paredez, Leticia Hernandez-Linares and Carmen Gimenez Smith. The event is sponsored by the Diversity Program Council, the DOW Center and English department.